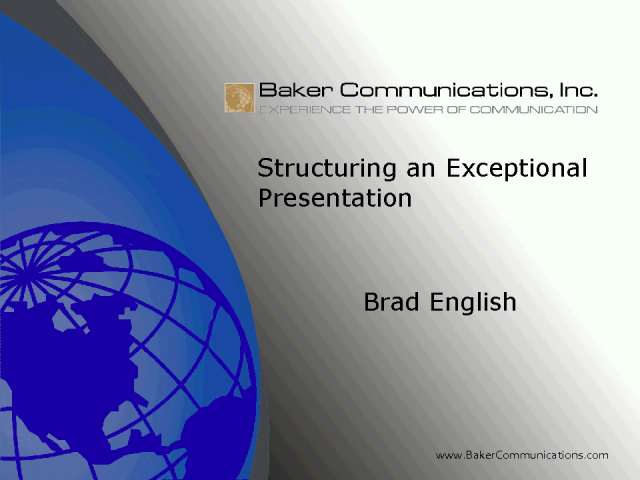 Baker Communications has developed an Exceptional Presentations Process that has become the gold standard in presentation skill training. After over 25 years in the business, our Exceptional Presentation Process remains extremely popular with every one from beginning sales representatives to C level executives at many of our Fortune 500 clients. There is absolutely no more powerful or effective process available today to help improve your presentation skills whether you are persuading, educating, or informing clients, employees, executives, board members or your local grass roots organization. This webcast will focus on effective, persuasive communication skills, including preparation, structure, delivery, strategy, use of visual aids, and handling question and answers.